May this holiday season’s blessings of Wealth, Health, and True Happiness rest upon you and yours today and always. No matter what you celebrate, with whom, and how, or even if you don’t celebrate a particular holiday at all, the crystals are reminding you and I to take at least a few minutes to ourselves each day to go inward and reflect back on the many blessings we’ve enjoyed over the past year. Journaling would a good process, and it may be helpful to take out a calendar to clearly mark the milestones that have been reached. Even as you review the disappointments or heartaches of the past year, can you go inside to that inner knowing and seek out the blessing and message to be found within even in those times? For truly, there is Joy to be found in all moments, good and bad. For the good times, it’s easy to reflect and be happy. For the not so good times, see how you’ve grown as a result. Maybe it made you reach out to others and connect in a way you hadn’t before. Maybe it made you realize that things in your life needed to be changed. Maybe you realized that this thing that was in front of you really wasn’t that important after all in the end, in the bigger picture of things. 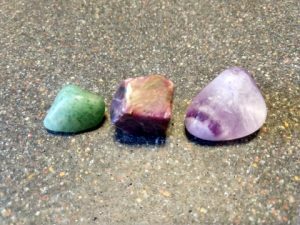 Wherever your reflections take you, feel free to seek out the heart healing energy of green aventurine, the grounding energy of ruby, and the mental clarity of amethyst to help you. They, and all the crystals and I, are always available to assist.